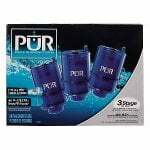 The PUR FM-9400B Faucet Water Filter System 3-Pack is a 3-stage horizontal chrome faucet mount filter system. The PUR FM-9400B comes with one 3-stage PUR faucet filter (RF-9999) which removes or reduces lead, mercury, sediment, dirt, the bad taste and odor of chlorine, and numerous other harmful impurities and contaminants. The PUR FM-9400B faucet system is a horizontal swivel design which can be installed easily and quickly without tools. Using a bypass feature, this PUR faucet filter allows you to switch between filtered and unfiltered water for drinking, cooking, and so on. The built-in filter life indicator reminds you when it is time to replace the filter. 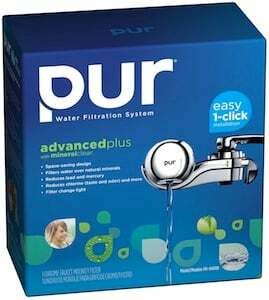 The replacement filter for the PUR FM-9400B faucet filter system is the 3-Stage RF-9999, though it can also use the 2-Stage PUR RF-3375 filter. 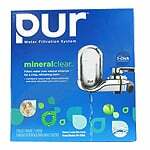 However, the PUR RF-9999 faucet water filter is more advanced and removes many more impurities and contaminants. Both the PUR RF-9999 and PUR RF-3375 work for up to 100 gallons or about 2-3 months before needing to be replaced.